Fractions can be deadly...well, tricky anyway. Just think about all of the wacky rules involved in computing with them entail. The larger the denominator the smaller fraction. Two fractions with completely different numerators and denominators can be equal. Now, how the heck can that be true? Don't even begin to talk about reciprocals or improper fractions. And then, on top of all of this, we have to reduce these babies? Fractions aren't playing fair, and that's all there is to it. Years ago I worked at a school for at-risk high-schoolers, I loved that job. I clearly remember sitting beside with an ex-gang member with a tear-drop tatooed at the corner of his eye and the words 'love' and 'hate' tattooed on the flesh between his scarred knuckles and finger joints. As I presented the notion of reciprocal fractions, I noticed the hand clenching his pencil wasn't not the one with 'love' printed on it. After we spent a good bit time talking about the mental gymnastics behind working with fractions and playing my game, my decorated pal began to understand the illogical logic behind computing with fractions. The scowl behind the teardrop tatoo softened. "Is that all there is to it?" he asked. I answered, "Yep. That's it." So, let's you and I play Fraction War. 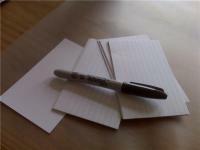 First of all gather up some index cards and a marker. Uh, oh! 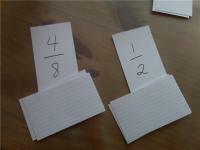 Like the regular game of War, you might hit a stale mate, that is when the players have pulled two cards of equal value, or 'equivalent fractions'. In the picture 4/8 is equivalent/equal to 1/2. If that happens (and it will, hence the name WAR!) 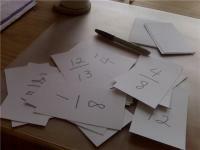 the players should proceed to draw three extra cards from their stack on hand and place them face down from their stack. And then flip the next card in their stack on top of the faced down group already on the playing table. In this case, if we had agreed to play 'High', the 1/8 would take that stack because 1/8 is bigger than 1/9. The more cards you make, the longer the game takes. 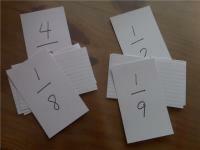 If you really want to challenge yourself, create an assortment of fraction cards with tenths, hundreths, and thousandths as denominators to be paired against decimal cards of equal value. 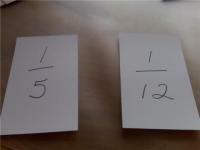 It also great fun to play with improper and mixed fractions in the stack. Yeah, I can be quite sadistic when it comes to fractions. I really like working with them. Blame it on Fraction War!